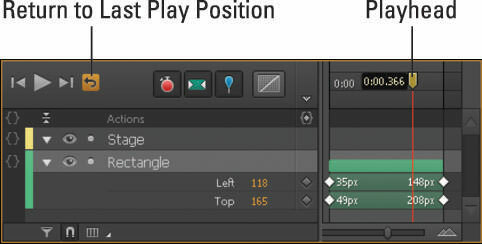 The Timeline in Adobe Edge Animate is located at the bottom of the interface. It has Play controls such as Play, Rewind, Fast Forward, and Return to Last Play Position (see the figure). Play, Rewind, and Fast Forward: These are the basic controls you’ll find on any kind of media player, and Adobe Edge Animate CC has them for your use. Return to Last Play Position: Sometimes you don’t want to return to the beginning of an animation when you finish watching it. That’s especially true when your animation starts to get long and (say) you have a particular section that you want to tweak. This control gets you back to the point at which you last stopped playing the animation, as often as you like, with no fuss. When you have your animation ready to test or view, you can click Play to watch the animation play out on the Stage. Likewise, you can click Fast Forward or Rewind to (respectively) advance the animation quickly or back it up just as fast. The Return to Last Play Position will return to the point in the Timeline to where you left the Pin. You can also press the spacebar on your keyboard to play the animation. The animation will play in its entirety if the Playhead is at the end of the Timeline. You can also watch your animation unfold simply by clicking and dragging the Playhead back and forth over the Timeline. By default, the Return to Last Play Position icon is grayed out, because the last play position was at the beginning of the Timeline. When you start to create your composition, you can move the Playhead further out along the Timeline. Doing that activates the Return to Last Play Position button as shown. When you click the Return to Last Play Position after you play the composition, Edge Animate brings you back to where the Playhead was on the Timeline, as opposed to bringing you all the way back to the beginning.